Armenian Meatball Kebabs in Flatbread - A recipe from Savor California, the online showcase for extraordinary gourmet foods and beverages from California. Using your hands, mix all ingredients together in a large bowl just until combined (overmixing may toughen the meat). Gently make meatballs and place on cookie sheet. Place in oven for 30 minutes, check to make sure they are done. If not, leave in for another 5 minutes and check again. While the meatballs are cooking, wet the lahvosh under the faucet and layer it between two moist towels for about 20 minutes. 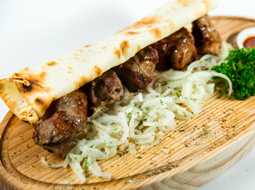 Serve the meatballs wrapped in the lahvosh, with sautéed onions on the side, if desired.